Click on a thumbnail, below, to view the full-size image. All images are copyrighted. And when you're done, click here to check out our NEW photo gallery with over 130 pictures and descriptions! Use the "slideshow" option for best viewing. 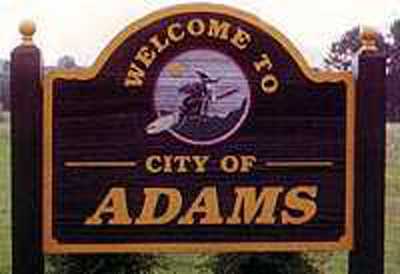 Welcome to the City of Adams, TN. Note the witch on a broom, which has become a symbol of Adams. This is one of the most photographed attractions in Adams, yet it has absolutely nothing to do with the legend of the Bell Witch. 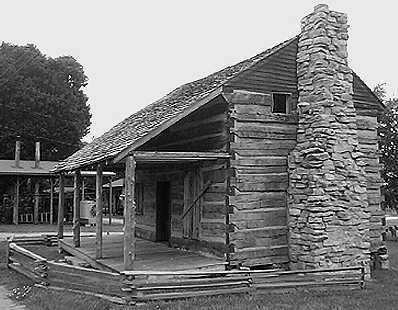 This cabin, built in the 1810 timeframe by John Bell's family, is believed to be the only surviving structure from the original Bell plantation. It was used as an outbuilding for many years. It can be found behind the Bell School building on Highway 41. 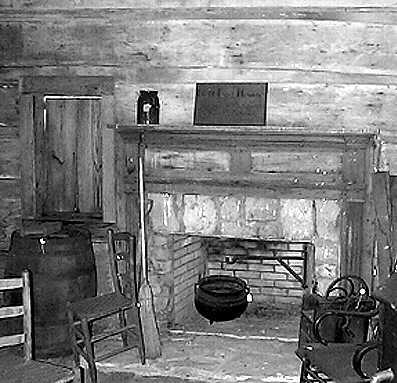 This is the interior of the log cabin, showing the fireplace and many antiques. The house was originally located on the old Bell plantation, but was later moved to the grounds of the Bell School. The Red River runs thought Montgomery and Robertson counties in Tennessee. The Bell plantation was situated on the Red River not far from where this picture was taken. 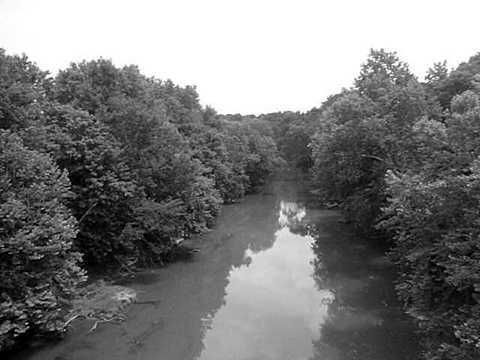 The "Bell Witch" wreaked havoc all along the Red River. 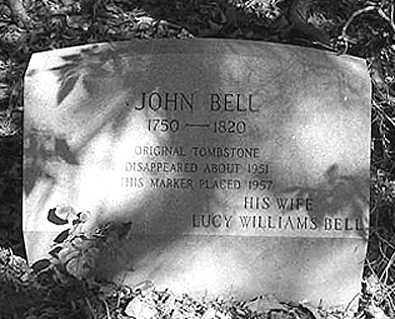 John Bell's gravestone. The original marker was stolen in the 1940's. The boy who took the original died a couple of days later. The marker shown above was placed about 1957. The new stone is NOT on Bell's original grave. 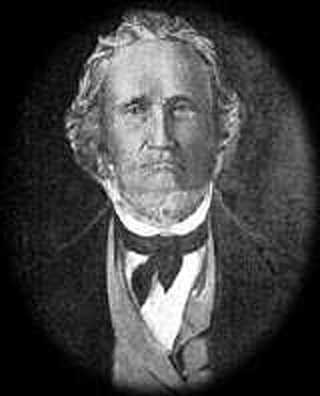 This is the only known oil painting of John Bell, Jr. (1793-1862), the second oldest of the Bell children. He lived near the original Bell plantation. A drawing of Elizabeth "Betsy" Bell, who was continuously tortured by the "spirit." This popular drawing has been featured in books, television specials, and all over the Internet. In real-life, Betsy Bell was a tall, heavy-set girl with a big smile (well, some of the time) and strawberry-blonde hair. It is said that she was very witty and cheerful. Her weight let her down later in life, and she moved to Mississippi due to ill health. Thick underbrush is all that remains of the original John Bell cemetery somewhere in Robertson County, Tennessee. The cemetery has been subjected to both neglect and vandalism over the years. In addition to John and Lucy Bell, and possibly three of their children, about 25 slaves are buried here. The cemetery, along with the remains of the old home and well, are privately owned by a foundation. The public is not permitted to access these areas. Originally built on land donated by Charles Bailey Bell in 1913, and rebuilt following a fire in 1919, the Bell School served its original purpose until the mid 1970s. 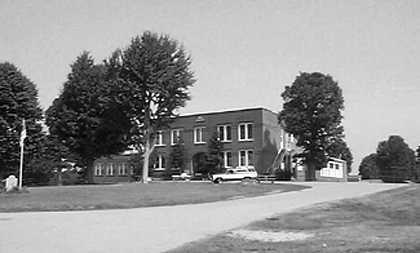 It was later used as an antique mall, and is currently the home of the Bell School Antique Mall and the Adams Museum and Archives. Many people have reported supernatural encounters while inside the building and on the grounds. 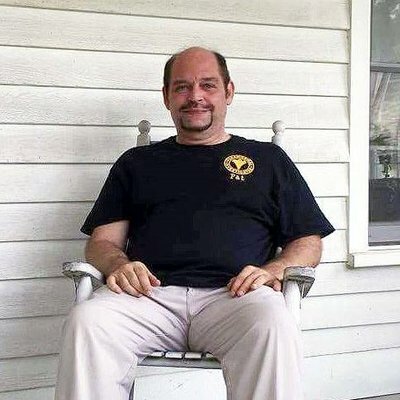 Charles Bailey Bell was the great-grandson of John Bell, of Bell Witch fame. 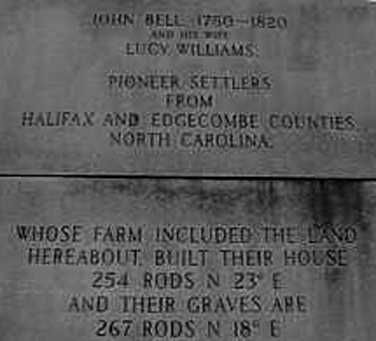 A number of John Bell's descendants are buried here, including Charles Bailey Bell, who wrote a book about the "Bell Witch" in 1934. Judge John Bell Turner, who contributed to an earlier account, is also buried here. Many visitors to Bellwood Cemetery have described encounters with the supernatural. 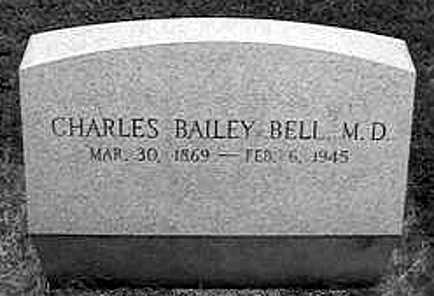 Charles Bailey Bell wrote "The Bell Witch-A Mysterious Spirit" just one year prior to the spirit's promised 107-year return. It is still unclear whether the spirit returned in 1935--or even left the place to begin with. 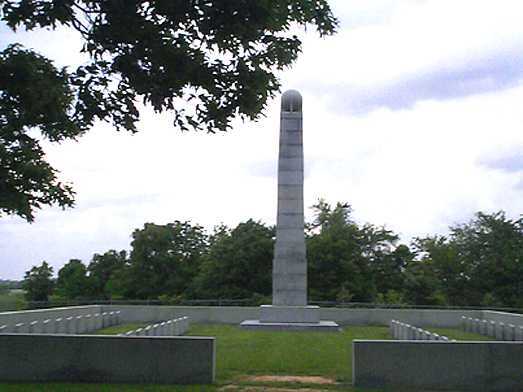 This monument was erected at Bellwood Cemetery in honor of John and Lucy Bell, who have several descendants buried there. Other sides of the monument pay tribute to other members of the Bell family. Once the main road that wound past the Bell plantation and through the Red River Settlement, this road is now used for routine farm work. The entrance drive to Bellwood follows the exact path of the old road, and the road extends across Highway 41, where it is known as "Bell's Cross Road." Kate Batts, a character in the legend, lived on Bell's Cross Road not far from where Highway 41 is today. Many floating lights have been spotted in this field. Just beyond the clump of trees stood the home of Kate and Frederick Batts. 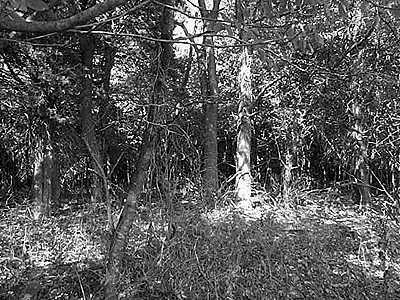 Mrs. Batts was believed by many to have been the culprit behind the disturbances known as the "Bell Witch." She was a poor woman, and was often made fun of by others throughout the Red River Settlement. Her improper usage of words, along with her sometimes strange ways, led many to think she was practicing Black Magic or other forms of the occult. This is how the spirit got it's nickname, "Kate." 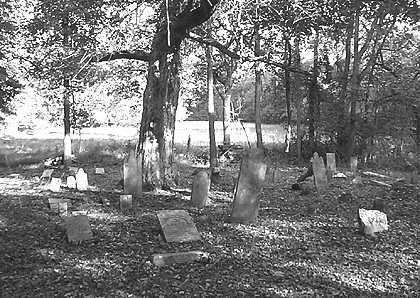 This cemetery is the final resting place Kate and Frederick Batts, Benjamin Batts, Jerry Batts, and others who figured into the legend of the Bell Witch. Benjamin Batts (no close relation to Kate) had a dispute with John Bell over the sale of a slave. 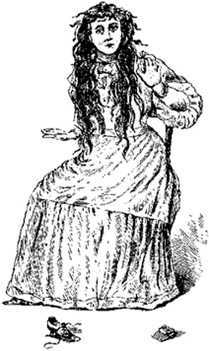 The dispute was later "tangled," and became the source of a rumor to the effect that John Bell and Kate Batts had the dispute, and the Bell Witch was created by Kate Batts to get revenge on Bell. This cemetery is full of rabbits, snakes, spiders and ticks. 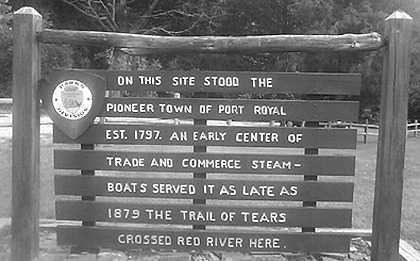 Port Royal was the closest town to the Red River Settlement during the days of John Bell. Bell's sons carried goods from Port Royal to New Orleans, where some believe that John, Jr. learned the art of ventriloquism which was used to produce the "Bell Witch." Port Royal was also home to George Hopson, John Bell's physician. Very little is left of Port Royal today. 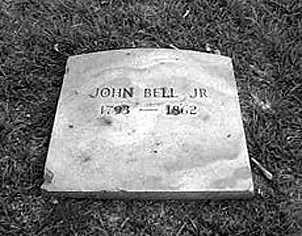 John Bell, Jr. is buried along with his wife and several children not far from the original Bell plantation. Situated atop this hill and amid the trees was the home of John Bell, Jr. 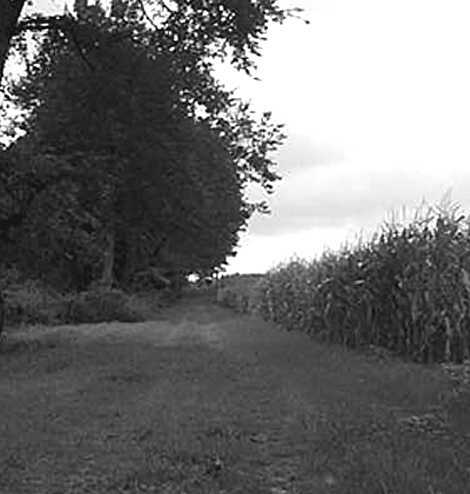 It was the site of many strange encounters experienced by John Bell, Jr. and others. The house stood many years after his death in 1862, and burned in the early part of the 20th century. 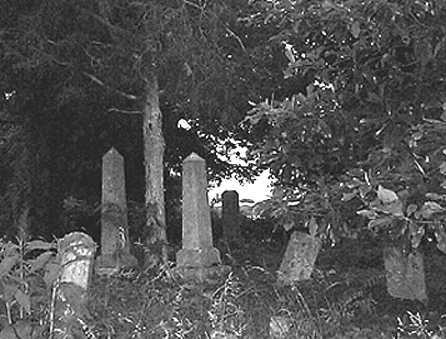 This cemetery, somewhere in Robertson County, Tennessee, is the final resting place of many people who figured prominently into the legend of the Bell Witch. Among those are James, John, and Calvin Johnston; David Gooch and Theny Thorn; James Long and Rebecca Porter, William Porter, and many others. 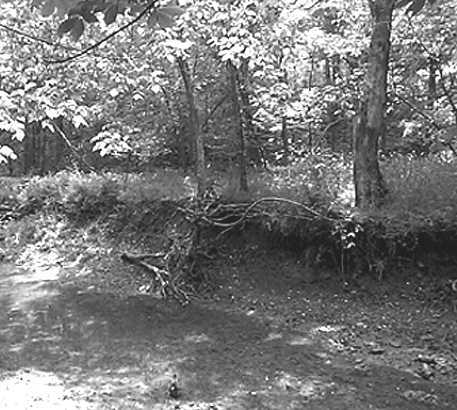 This is a small stretch of the "Enchanted Spring," which runs into the Red River on the northeast corner of the old Bell plantation. It was at this spring where Betsy Bell broke off her engagement to Joshua Gardner, and where two men heard loud music coming through the air in the latter part of the 19th century. 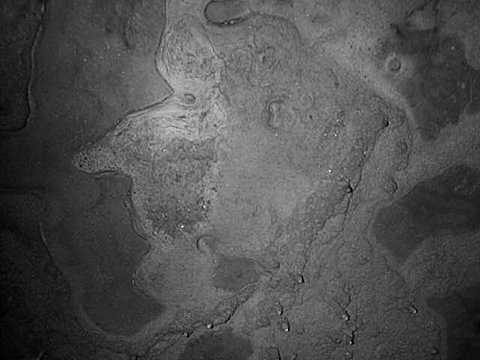 This natural rock formation denotes the side-profile of a "Halloween witch." Notice the forehead, eyes, nose, mouth, and chin. 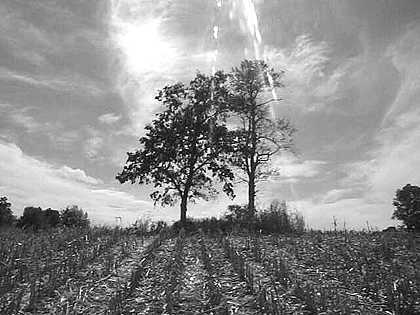 This field, somewhere in Robertson County, Tennessee, was once John Bell's front yard. The well was a few feet from the barn in the distance, and the house was near the tree-line. The old Bell Cemetery is on the small hill to the right. This grassy area was once the main road in the community. 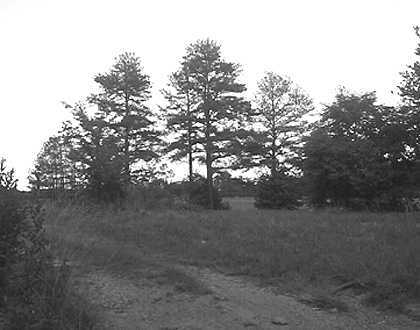 It was on this road that Andrew Jackson made his famous trip to the Bell farm and was halted by the "witch." The old Bell homestead was very close to where this picture was taken. This is Bell Road, located in the "Eureka" community outside Batesville, Mississippi. 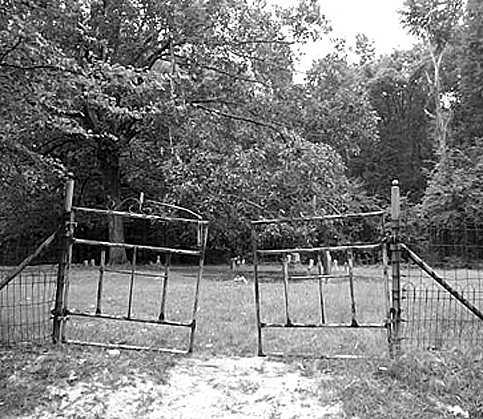 Some of the Bell Children moved to this area after the "haunting" in Tennessee. This is the final resting place of many who figured into the Mississippi version of the legend. 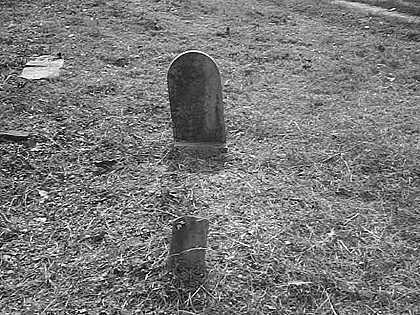 According to legend, the "witch" gave Martha Bell some stockings and told her to make sure she was buried in them. 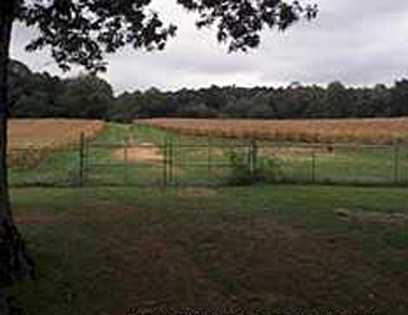 After moving to Water Valley, Mississippi about 1875, Betsy Bell Powell lived on this site until her death in 1888. She, along with her daugher Eliza Jane Powell and son-in-law Zadok X Y Bell (son of Jesse and Martha Bell), are buried nearby in Long Branch Cemetery. 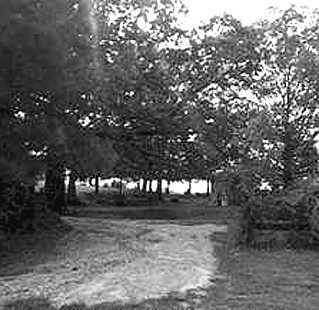 Long Branch Cemetery is situated on a partially-cut rural hillside not far from Water Valley, Mississippi. Long Branch is the final resting place of Betsy Bell Powell and several of her children. This is the grave of Betsy Bell (Powell). During her childhood, she was tormented by the "witch" more than any of the other Bell children. Betsey died in 1888 at the age of 82--outliving her siblings, her husband (Richard Powell), and her childhood sweetheart, Joshua Gardner, who died four years earlier. Now, click here for 100+ additional pictures!